QUESTION: Where does your overbought index stand on the stock market? ANSWER: This Index is proprietary. It peaked at 12.55 during October 1919 as capital had flowed to the United States due to World War I. The Index then declined thereafter into the August 1921 bottom at 10.40. From this point, the Index rallied into October 1925 peaking at 13.16, fell back for 15 months bottoming again in October 1927. The final rally lasted 14 months peaking at 12.95. The bottom came in July 1933 about 13 months after the actually low in nominal dollar terms during June 1932. 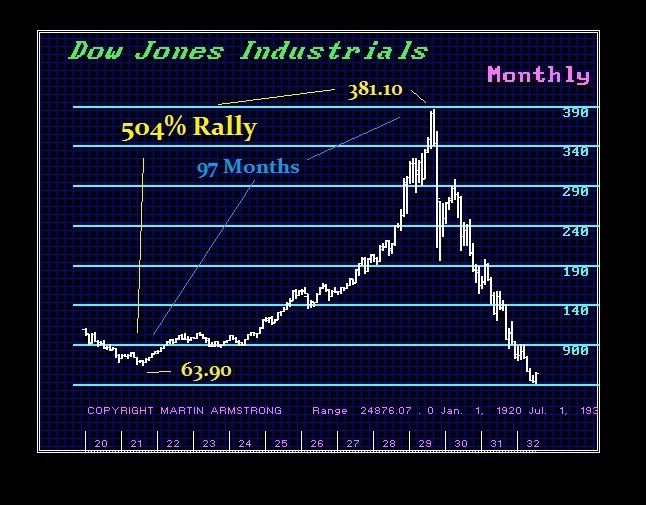 In nominal terms, the Dow tested the 1,000 level in 1966, 1968, and 1973 and again in 1980. We can see the shift in trend that came following the historical low in 1981. The core of this index is capital flows so it tends to reflect just how capital flees and concentrates moving relative to US assets. Looking at the most famous bull market of the Roaring ’20s, the duration was 97 months which we exceeded from the 2009 low in April 2017. The 2009 low was 6469.95 and the January high was 24,741.70. which was a rally of only 282% – not anywhere close to the Roaring ’20s. This index is proprietary and it affords us a look at the asset class from a global perspective. 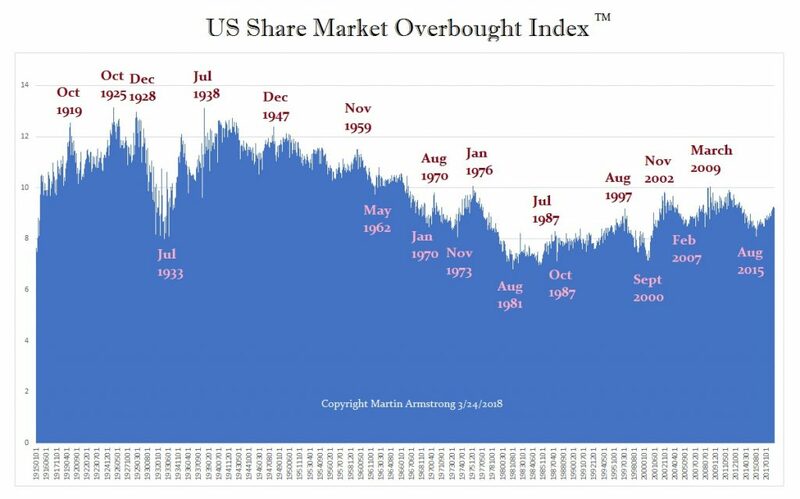 This is part of the reason we have been warning that the bull market is by no means overbought and the bulk of forecasting out there has made this the most hated bull market in history because they look only at the nominal index without placing it within its global context.